Thanks to all of you who visited us at the Stuart Boat Show. 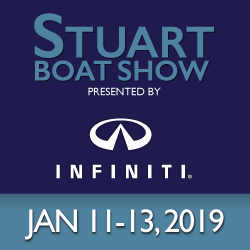 The Annual Stuart Boat Show is the largest boat show on the Florida Treasure Coast featuring over 190 local, national and international exhibitors displaying hundreds of boats in-water and on land. Many boat brands are represented at the show, including the latest models of motor yachts, cruisers, center consoles, speedboats, sport fishing boats, and pontoons ranging in size from 12 feet to over 80 feet in length. Additional exhibits include the latest in personal watercraft, marine electronics, outboard and inboard engines, safety equipment, accessories, boat lifts, fishing gear, nautical clothing and jewelry, as well as financing and insurance companies. Plenty of seminars, music, delicious food and drinks add to the festivities.